ONE CHANGE CAN MAKE A BIG DIFFERENCE. Protect yourself from risk of audits. Get paid correctly. Accurate medical coding is tough. It’s nuanced. Prone to misinterpretation. It’s one of the riskiest area of the revenue cycle. Insurance companies know that. When ICD-10 arrived, codes exploded to 155,000 (PCS and CM). Insurances have begun to need greater levels of specificity. Earlier, you’d use 530.11 as ICD-9 code for Reflux esophagitis. In ICD-10, you have to get specific and code for K21.0 – Gastro-esophageal reflux disease without esophagitis. This change in scenario is leading to more scrutiny. We see it everyday with our clients. Greater demonstration of medical necessity. More comprehensive medical documentation. To get paid correctly. 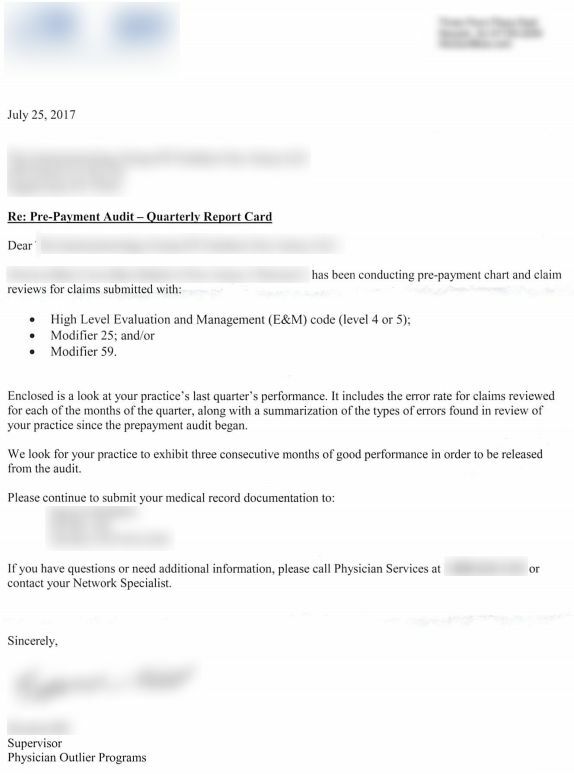 Take a look at this audit letter. What do you do when an insurance company sends you something like this? Money you save during the year is spent fighting the audit. If you don’t fight it, there’s a chance that insurances will hound you for more. And some more. Audits distract you from practicing medicine. The physician passes an endoscope through the patient’s mouth into the esophagus. The esophagus, stomach, and duodenum are viewed. A polyp is identified in the esophagus. The polyp is removed using snare technique, the endoscope is removed. Which CPT code will you choose? If you chose 43250, you coded wrong and the claim would likely be denied. 43250 is EGD with removal of tumors, polyps or other lesions by hot biopsy forceps. 43251 is EGD with removal of tumors, polyps or other lesions by snare technique. The physician has used snare for polypectomy hence 43251 is correct code. Let’s consider, even if you don’t get a denial for using 43250. You get paid $410 by Medicare. If you chose 43251 (which is actually the correct code), you get paid $450. That’s a difference of $40. Say, you saw 50 patients of the kind in a month. Such a coding mistake would cost you $2,000/month. That’s the challenge of coding. Even a single mistake has the power to reduce your reimbursements. In the form of billing mistakes. Coding certifications are difficult. The exam itself takes 5 hours 40 minutes. Plus, it requires several years of experience to understand the nuances of the human anatomy. Patient is scheduled for screening colonoscopy. Patient’s mother was suffering from colorectal cancer. Colonoscopy did not reveal any abnormal findings. How will this colonoscopy be coded? As patient’s mother (close relative) was suffering from colorectal cancer, this patient will fall under high risk. The correct screening CPT code will be G0105 (Colorectal cancer screening; colonoscopy on individual at high risk). The primary ICD-10 code should be Z12.11 (Encounter for screening for malignant neoplasm of colon) followed by family history code Z80.0 (Family history of malignant neoplasm of digestive organs). This is how an experienced coder would code. The wrong selection of CPT code may include G0121 which is for average risk of cancer. Selecting Z80.0 as primary diagnosis can also be considered a coding error. Calculate the salary, benefits, payroll taxes and the cost of ongoing coding education to figure out whether it’s worth it for you to do this in-house. Here’s the average cost of a coder. A coder charges anywhere between $12.44 – $24.75/hour. And, averages between $26,231 – $53,958 yearly [reference]. Now what if your coder goes on leave? How much does that delay cost your revenue cycle? We’ve been working with gastroenterologists since 2005. Our depth of experience helps us deeply understand the specialty. We’ve invested thousands of hours in building a certified gastroenterology coding team. That keeps up with continuous changes. Improve your coding accuracy by using our ongoing, periodic, or one-time coding services. Getting audited by insurance companies can result in immense anxiety and uncertainty for you and your staff. Will they ask for payment recoupment? Why have they selected me for an audit? What are the legal implications? These are some questions that haunt even the most stable practices. You can either try to navigate the audit on your own, or use a team of CPC certified coders to help you along the way. We help you avoid risks and achieve compliance with in-depth coding reviews and training. Benefit from ongoing coding services to improve coding accuracy and optimize revenue. We’ve have put countless hours understanding gastroenterology billing and coding. And, we want you to be sure of the quality you can expect when you begin with us. Try it. If you don’t LOVE it, there’s no obligation to continue. No hidden clauses. It’s simple. Send us your de-identified medical records. We will send you the coded files and even provide you our reasoning to code it a certain way. You can then make the decision to continue or discontinue. (We will need to complete a HIPAA Business Associate agreement if you’d like us to access your records as-is). We know this can be a big decision. With this free trail you get a hands on experience of working with us and assess whether we are a fit. It’s free. There’s nothing to lose. You started practicing medicine to focus on providing quality services to your patients. But, with regulations, reimbursement pressure and increasing costs, it is becoming more and more difficult to manage everything on your own. It’s time to make the change and improve your practice health.